Isabella Ure was born in 1828, the only daughter of Alexander Ure, a Writer (lawyer) in Glasgow. 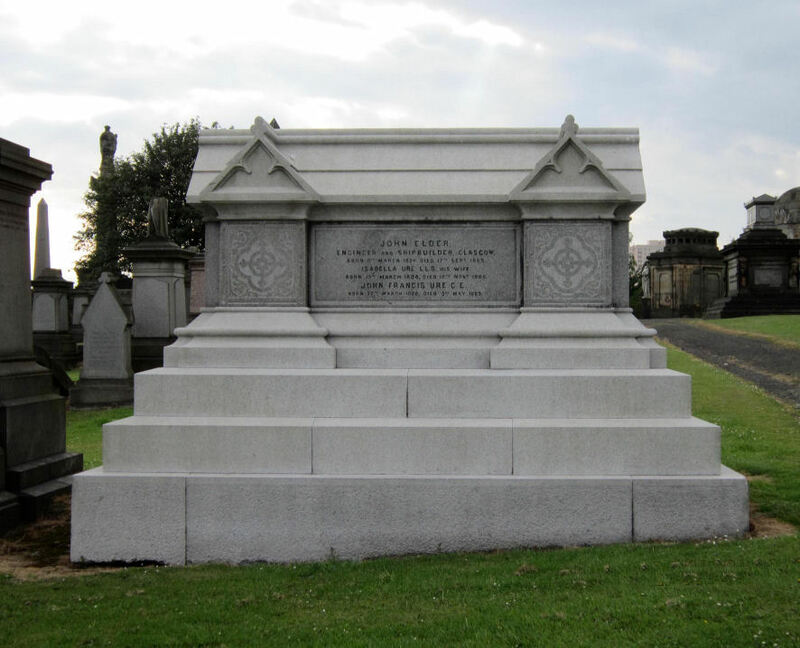 In 1857 she married John Elder(1824-69), a partner in Randolph, Elder & Co, marine engineers in Glasgow. He was described as a man of genius whose marine engines enabled ships to travel further and so opened up shipping trade. Under John Elder’s direction the business thrived, and acquired a shipbuilding yard at Govan in 1860. By 1868, when the firm became John Elder & Co and moved to the Fairfield Shipyard in Govan, it was recognised as one of the world’s leading shipbuilders and marine engineers. Unfortunately John Elder died at the age of 45 in 1869 leaving Isabella a widow with no children. Despite suffering poor health, she ran her husband’s vast shipbuilding business for nine months after his death until it was transferred to a partnership led by her brother John Ure. She then spent some time abroad. Both she and her husband had philanthropic ideas and she tried to envisage what they both would have done in the spheres of Science, Education and the Physical and Moral Welfare for the working class of Glasgow and Govan. For the 36 years of her widowhood she lived at number six Claremont Terrace which bordered onto Kelvingrove Park and just across the park was Glasgow University. Until 1877 women were not accepted at this University and there were no facilities for the higher education of women. 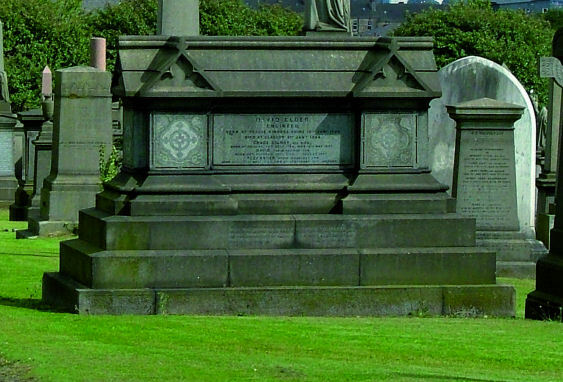 The University of Glasgow and Glasgow and West of Scotland Technical College (now the University of Strathclyde) both benefited and the following description highlights the contribution she made towards the development of higher education as well as medical education for women and also the help she gave to the people of Govan to improve and maintain their health and welfare. An association, which included Mrs Elder among its members, was formed in 1883. In1884 she bought North Park House (designed by JT Rochead for the Bell family who founded the Bell Pottery and who are also buried in the Glasgow Necropolis) near the Botanic Gardens, Glasgow. The association was incorporated into a college in this building and called Queen Margaret College. It was the first and only college in Scotland to offer women higher training similar to that of Universities, especially in Arts and Science, but they still could not be awarded a degree. There was also a medical school established within the college in 1890 which was to be named the Elder School of Medicine in recognition of Mrs Elder’s work. In 1892 Women were granted the right to obtain degrees in Arts, Science and Medicine and the first four women in Scotland graduated from Queen Margaret College with medical degrees in 1894. In recognition of her late husband’s enthusiasm for promoting the application of scientific principles in industry, she gave a supplementary endowment of £5,000 (£216,400 2007) to support the chair of Engineering (in 1873) and £12,500 (£657,750 2007)to endow the Elder Chair of Naval Architecture (in 1883) at Glasgow University. She also contributed to the building fund, and to provide lectures in Astronomy, at the Glasgow and West of Scotland Technical College,(now the University of Strathclyde). 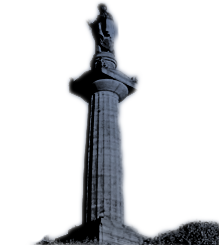 For Govan, which was a separate burgh from Glasgow until 1912, Isabella Elder bought 37 acres of land opposite Fairfield’s shipyard where her husband had made his fortune. She laid it out as a public park, named the Elder Park in memory of her husband and her father-in-law David. It opened with a great celebration in 1885 for the people of Govan to have healthy recreation and for many years she paid for an annual fireworks display there. She also opened a school of home economics for women to learn about nutrition and cooking run by Miss Martha Gordon who also would visit homes to give practical advice. The classes met twice a week and included lessons on the influence of food, clothing, cleanliness, ventilation, care of children and prevention of the spread of infectious diseases. In 1890 Mrs Elder employed a district nurse to give instruction in classes and visit homes. In 1901 the Duchess of Montrose founded the Cottage Nurses Training Home to bring the village system of nursing, which had proved so successful in England, to Govan. Mrs Elder provided this project with its first home. Women were trained in district nursing and also became Certified Midwives for all areas of Scotland. In 1902 at the age of 74 Mrs Elder’s next project was the building and equipping of a Cottage Hospital for the people of Govan. It had been originally planned to be a Maternity Hospital and there is a stone carving above the door of a woman and child. However she finally decided that it would be of more value as a general Hospital and It consisted of 30 beds in two wards named Florence Nightingale and SophiaJex Blake after two contemporaries of Mrs Elder. She funded the running of this hospital until her death in 1905 and it finally closed in 1987. In 1901 Isabella Elder was awarded an honorary degree of LLD, the first time any woman had been so honoured and in 1906, the year after her death, a statue of her dressed in her academic robes was unveiled in Elder Park.